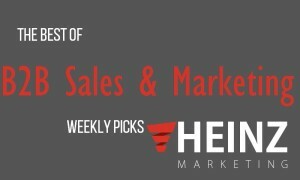 In addition to our Sunday App of the Week feature, we also summarize some of our favorite B2B sales & marketing posts from around the Web each week. We’ll miss a ton of great stuff, so if you found something you think is worth sharing please add it to the comments below. Some excellent tips for being successful when it comes to your writing. Thanks, Derek Ralston. Marketing automation can be essential for businesses and marketers, but a powerful platform doesn’t mean anything without the right pieces in place to set you up for success. Great article, Helen Veyna. Just Because We’re In Your ICP Doesn’t Mean I Have A Need To Buy! The ICP is the starting point for all your prospecting, but its JUST the starting point. Thanks for your thoughts, David Brock. Is There Really A Best Time To Send Marketing Email? There’s a lot of debate about the best time to send marketing emails, but is there really one time that’s most successful? Thanks for your insight, Paul Talbot. A number can be too abstract sometimes, which means that it isn’t going to stick. Thanks for the article, Alison Davis. Some helpful advice for how to tell your story. Thanks, Clifford Chi. What if your surveys are so long they distort your metrics? Thanks for the tips, Martha Brooke. A step by step for measuring performance. Thanks for your insight, Andrew Nguyen. Don’t let your blog suffer from silent blog syndrome… Thanks for the advice, Neil Patel. Attention has become a scarce economy these days, so how do you win? Great insight, Michael McNichols.